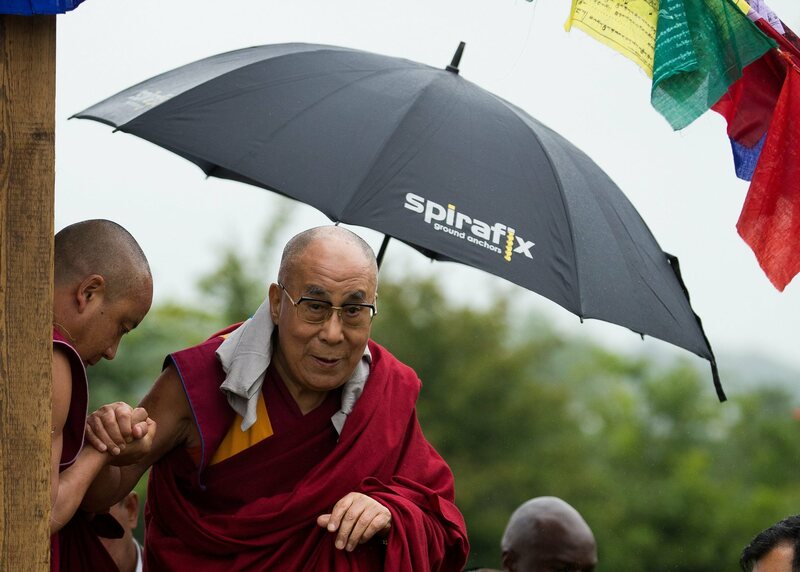 A great photograph of His Holiness the 14th Dalai Lama being protected from the rain at Glastonbury Festival. Glastonbury has a reputation for being subject to rainy weather and this was a real piece of luck for us - to think a Spirafix Ground Anchors umbrella was on hand at just the right time. We have been making and developing our ground anchoring system since 2002 which gives us a comprehensive understanding of installing our secure spiral anchors in all types of soil and in all types of weather conditions throughout the UK, Europe and beyond. We pride ourselves on our ability to solve your problems and we love a challenging project because we know we can add real value. We have a proven track record when it comes to saving time and money on site and we provide a real problem solver to many industries. We are a small but hard working, dedicated and focused team of professionals and we're keen to help you. There are a number of reasons why Spirafix Ground Anchors and accessories are better than the rest - not just our products but our staff and services too. We have been making and developing our ground anchoring system, with it's simple spiral design, since 2002 which gives us a comprehensive understanding of installing our secure anchors in all types of soil and weather conditions throughout the UK and beyond. We regularly test our own products to ensure we have the most up to date results to publish and share with our customers. Specialists - We don't make or sell other products - we are specialists in the ground anchoring business and have a proven track record to support our belief we are number one in the market. Technical support - Our extensive knowledge of ground anchoring comes from both developing the product range and installing them at many national events from Glastonbury to The Royal Welsh Show and Boomtown Fair to the Victoria and Albert Museum plus many, many more. It's this 'hands on' experience that gives us our superior knowledge and understanding of how the product works in so many different soil types and conditions. This image was taken using an iPhone at an event we attended. We exhibit across the UK throughout the year, we prefer outdoor events - especially when we have blue skies! 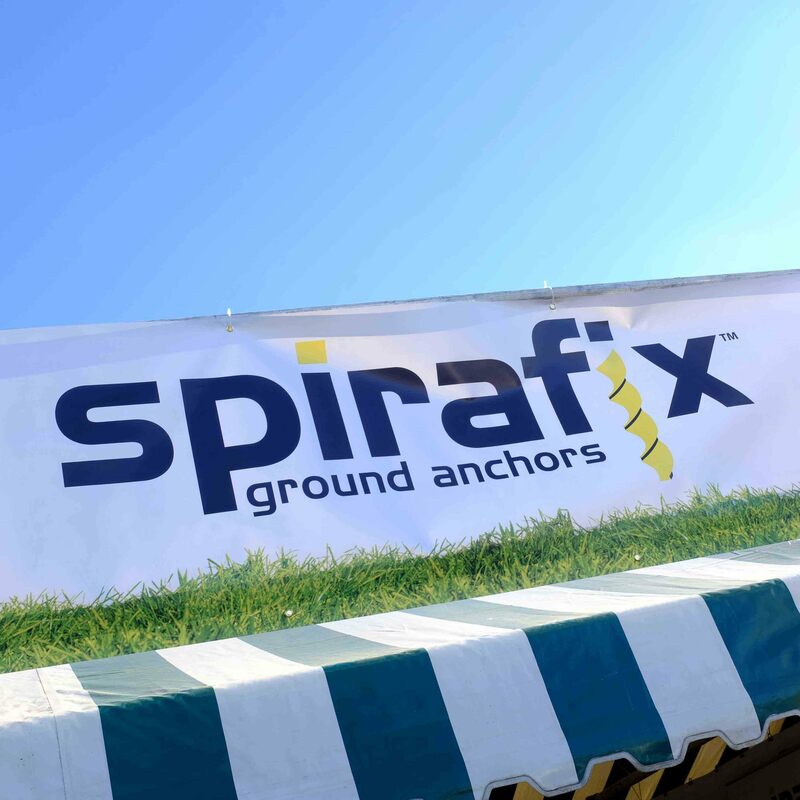 When customers / visitors see the Spirafix Ground Anchors in action they are always impressed. British made - we take pride in the fact that Spirafix Ground Anchors are made on site here in our workshop in South Wales. This allows us to oversee quality and standards at all times. We work with quality suppliers of our raw materials and demand product of consistent quality. This gives us confidence in the products we produce and the opportunity to carry out regular tests to support our in depth understanding of our products. Testing and results service - we have developed a portable testing system which allows us to provide our clients with detailed and specific information regarding loads and capabilities of our anchors in all soil and ground types. To support this we have the ability to provide certificates and documentation to add further peace of mind. Dedicated staff - we have a team, both in our office and in our workshop, that is dedicated to providing the best possible standard of service at all times. Our staff are friendly, professional and available 5 days a week.